Gareth Pugh Spring 2012 - Paris Fashion Week. Fashion statements with a fabulous futuristic touch opened up the Paris Fashion Week and definitely managed to become memorable. 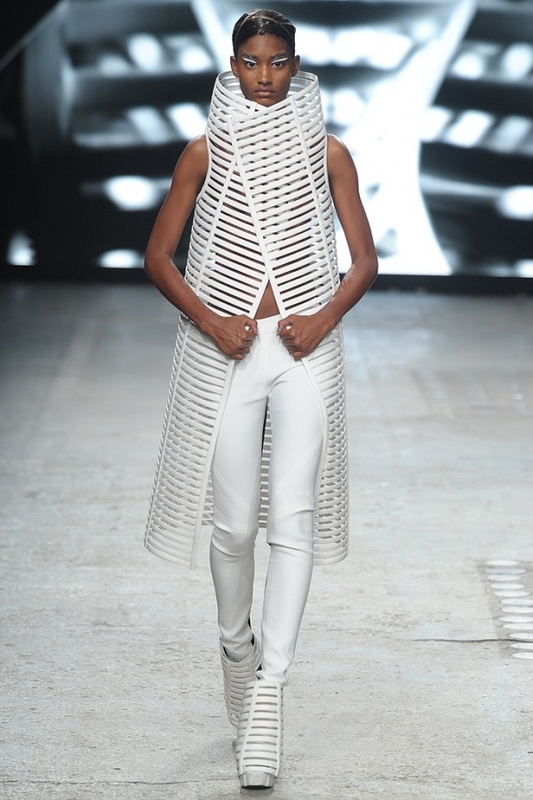 Gareth Pugh spring 2012 collection brought exciting and challenging fashion concepts that definitely attracted attention. 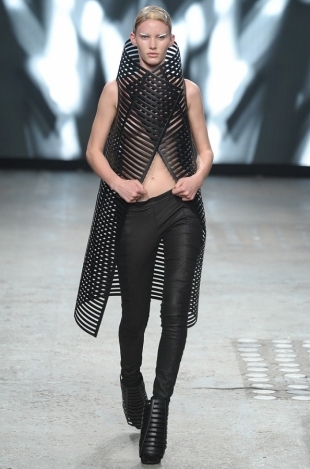 Take a closer look at some of the most intriguing designs released by the brand. 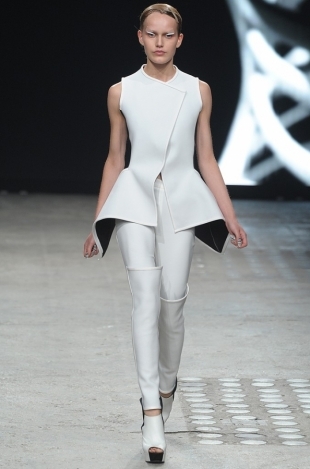 It's no secret that the Gareth Pugh brand is not going to endorse mainstream trends such as floral prints anytime soon. Instead, the designer, who has collaborated with Matthew Stone and Ruth Hogben in order to bring his collection to the state of masterpiece, focused on geometry to take his designs over the edge. 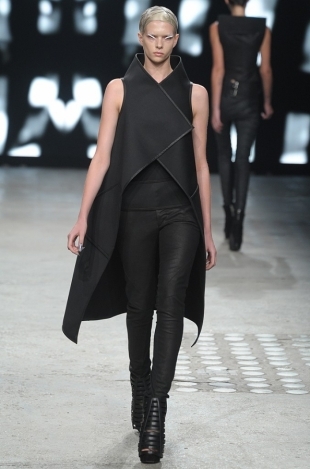 A dose of fetishism becomes immediately apparent, especially if we take into account the fact that the show opened with the naked former plus-size model Crystal Renn. With the notable aggressive touch that became apparent from the first moments of the show, the feelings of isolation and defensiveness were hard to miss: the cage-like coats with firm horizontal stripes that sometimes extended near the face and sometimes even covered it clearly highlighted the aforementioned message. With so much emphasis on structure, there was little need to turn to bold hues to take the looks to the next level: black and white dominated, while dark purple was used for a sleek style transition. The collection focuses on a variety of concepts and proportions vary depending on the concepts the designer is trying to get across. From perfectly fitted pants and dresses to over the top volumes and top notch structures, the futuristic vibe is extremely well represented. The accessories follow the same principles and the stripes motif is strongly emphasized. The insect-like cover in the final looks of the collection highlight the feeling of power and dominance like no other detail.